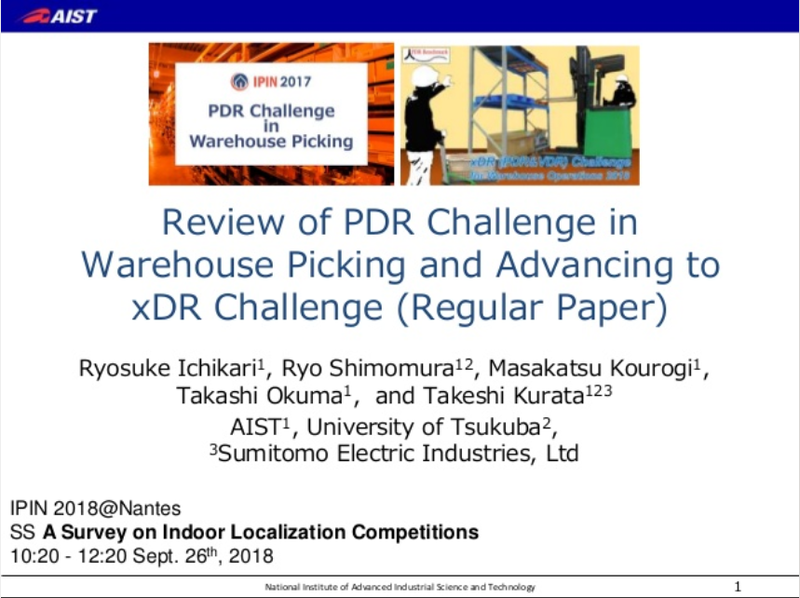 We gave following presentations in the special session "A Survey on Indoor Localization Competitions" at IPIN 2018.
xDR Challenge for Warehouse Operations 2018 (hereinafter referred to as xDR Challenge 2018) will be held as an sequel competition to "PDR Challenge in Warehouse Picking" [IPIN2017]. Same as last year’s competition, this year’s competition will be held as an off-site tracking competition by sharing sensor data measured in actual warehouse. 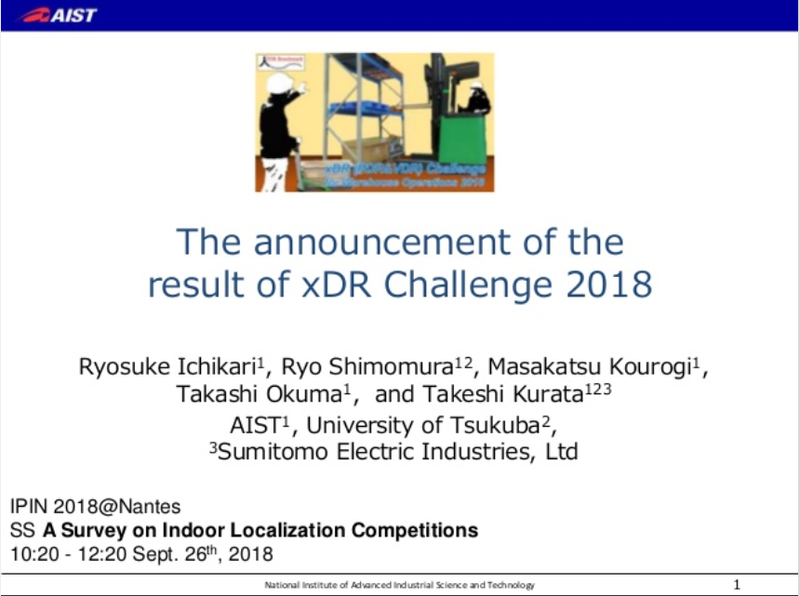 xDR Challenge 2018 will be hosted by PDR benchmarking standardization committee in Japan. This year, the targets for tracking competition are not only employees walking around the warehouse during the operation, but forklifts driven by employees. We call dead-reckoning of vehicle as VDR (vehicle dead-reckoning). This year’s competition is renamed as xDR challenge, which means a competition for PDR and VDR. For the world’s first competition for VDR, we measured sensor data by smartphones attached to the forklifts during the warehouse operation. Additionally, scale of the data measurement also upgraded. We measured more than 30 employees and 9 forklifts for one week (5 business days). The detailed whole body movement during the warehouse operation is also recorded by motion capture system as well as 3D reconstruction of the warehouse. They will be shared as the reference data for the competitors to learn what warehouse operations look like. Data format for sharing sensor data and evaluation metric will be adhered to the last year’s competition [MobiCase2018]. That is, evaluation will be integrated evaluation by considering not only positional error, but all potential evaluation metrics required for the warehouse operations. Similar to the previous PDR challenge, sensor-raw data, BLE beacon measurements, partial WMS logs are shared for competitor to estimate workers’ location. The submitted trajectories will be evaluated by an integrated evaluation metric. Similar to the PDR-Track, sensor-raw data, BLE beacon measurements, partial WMS logs are shared for competitor to estimate workers’ location. The submitted trajectories will be evaluated by an integrated evaluation metric. Runner-Up : No PDR, No Future! Copyright (c) AIST All Rights Reserved.